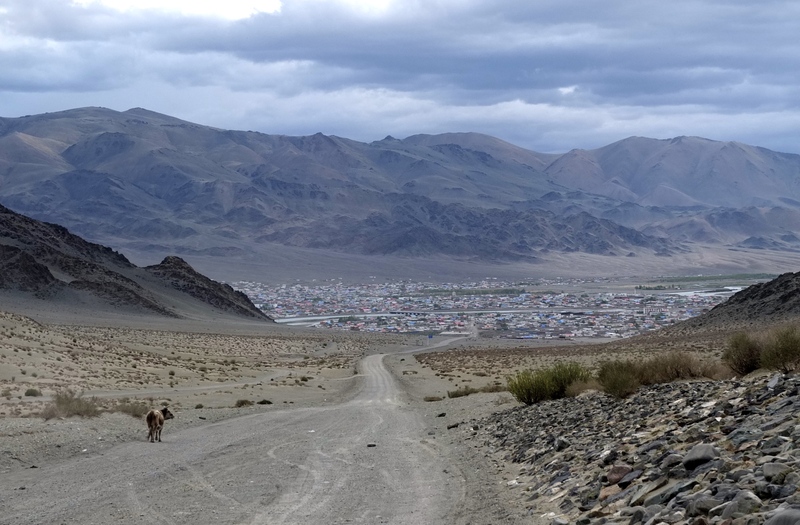 The last stretch from Ulaangom was the scenic highlight of my trip so far. 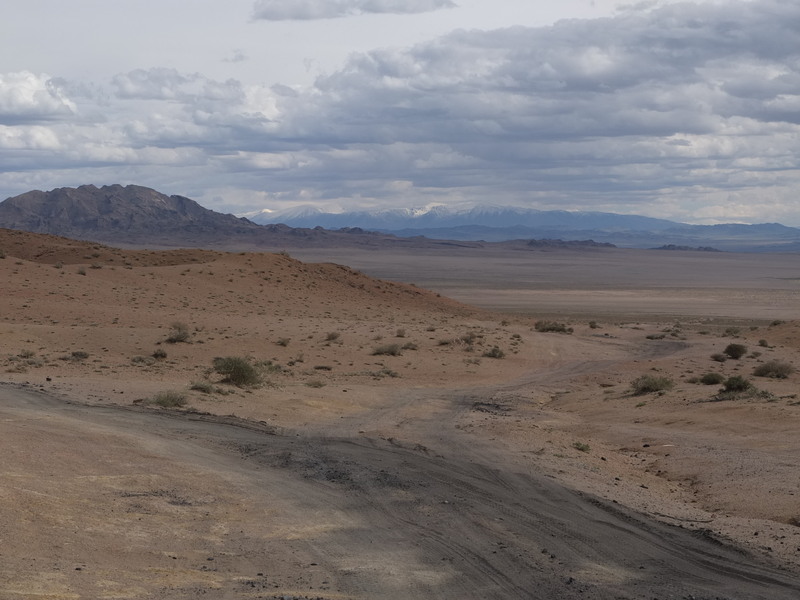 The amazing views were hard-won as I pedalled, pushed and dragged my bike through the mountains on horrendous road conditions (even for Mongolia). Leaving Ulaangom, I was exhausted. I really should have rested for two days instead of one. Ignoring my tired body I continued on the paved road for 40km out of the city. 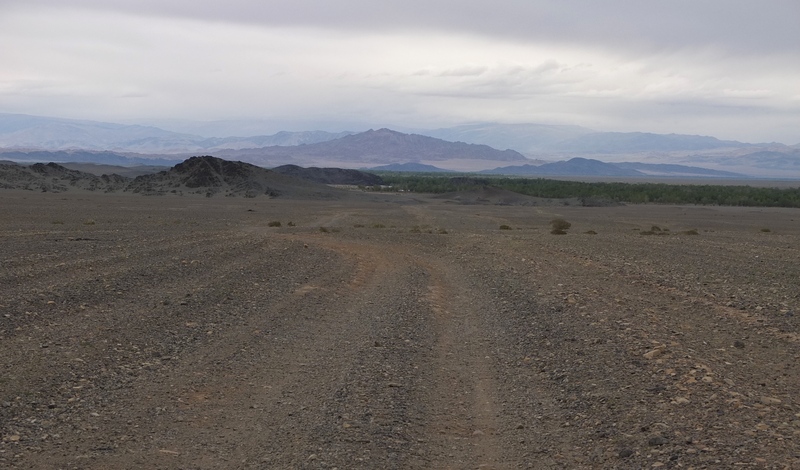 Then, to my left, a dirt road snaked its way uphill through a crack in the mountains. 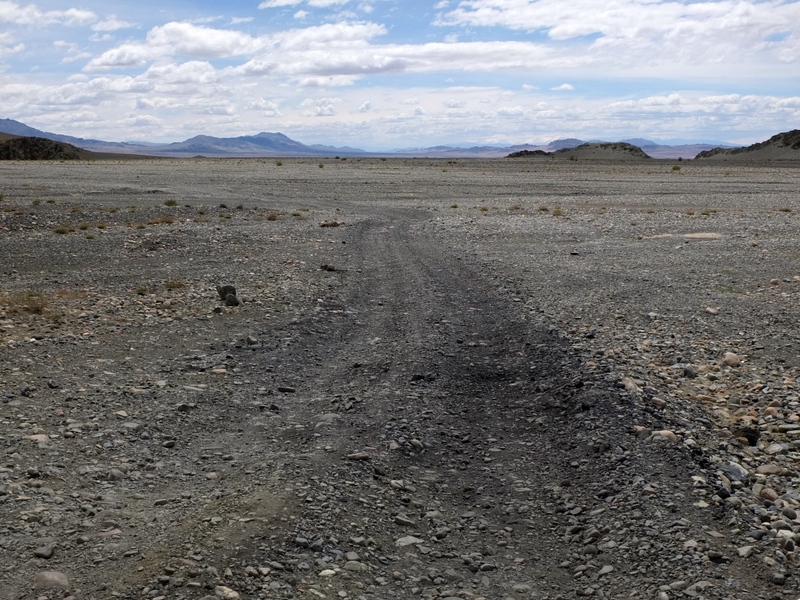 This was the gateway to the the Ulaan Davaa, or Red Pass, where I was headed. The next few hours were torturous for me. The initial moderate grade got increasingly steep and I had no power left in my legs. I started to push. Pushing is equally difficult, relieving one set of muscles while seriously stressing the others. The weather turned and it briefly began to rain, which turned into wet snow. I saw a van parked up ahead and a woman stepped out, motioning for me to sit inside and warm up. I was grateful for the break and chatted with the family inside. They were having engine troubles. Eventually I left and continued to struggle, pushing up the pass. 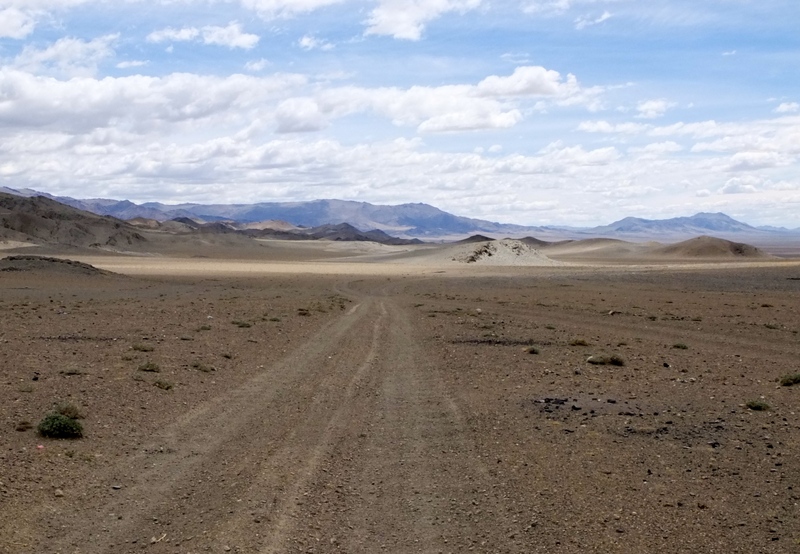 I could see now why it was called “Red Pass” – the hills all around have a reddish hue to them. I made myself smile through gritted teeth and laboured breaths at the beauty around. On the way up I hit a road block. 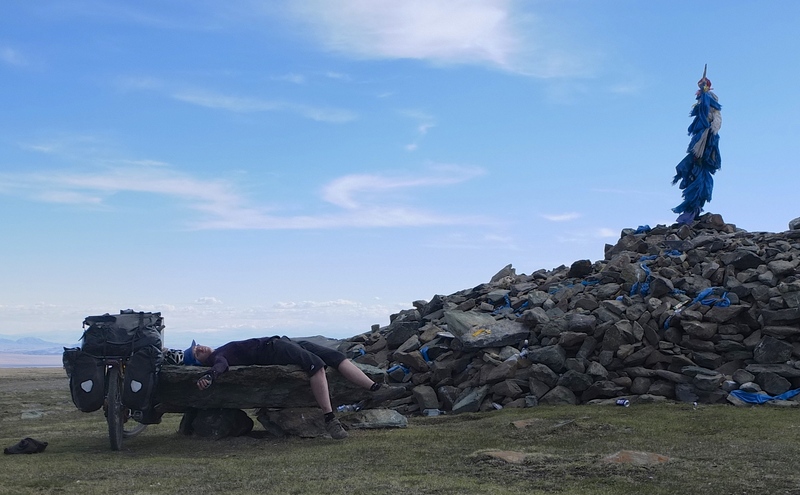 Soon, I saw the ovoo (rock cairn) in the distance and finally pushed my way to victory at the top. 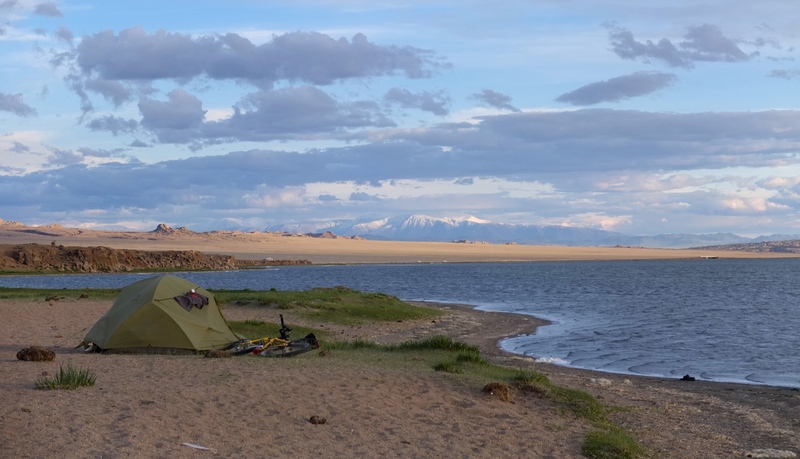 I had wanted to reach Üüreg Nuur that day, a spectacular lake with excellent camping. This was not to be, as I was too exhausted from all of the pushing. I pitched my tent near the bottom of the pass amongst the surrounding green hills. 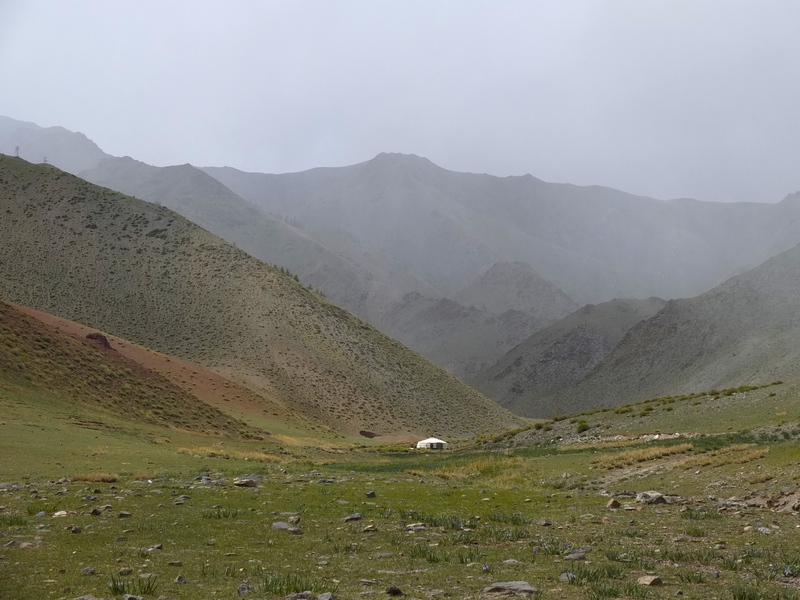 The next day I decided that I would stop to camp at Üüreg Nuur, even if it was only 30km away. The ride was beautiful, carving a wavering path through the mountains. Along the way, I met a motorcyclist from Germany. 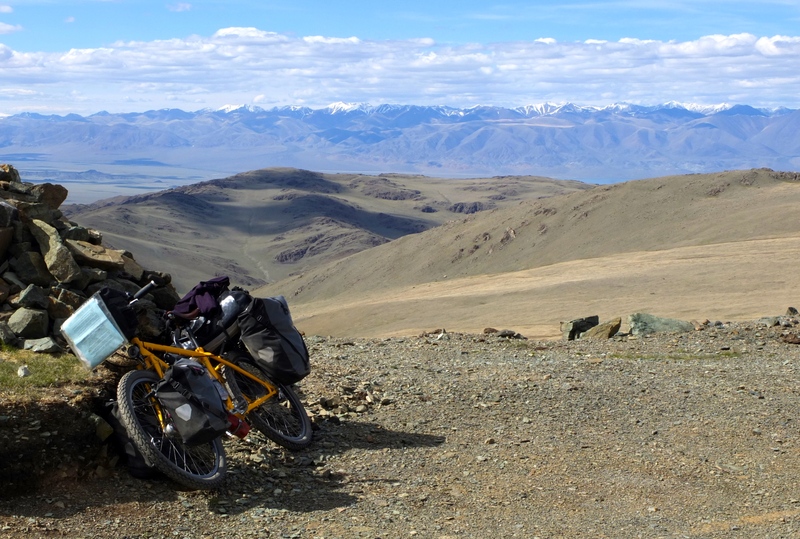 He was on 23,000km round trip journey from his hometown Germany to Mongolia and back. He looked pro with a Red Bull branded jacket and pants and flashy iridescent googles. He wondered why I was cycling, when I could have chosen a much faster form of transport. If he asked me that the day before, I probably would have agreed. 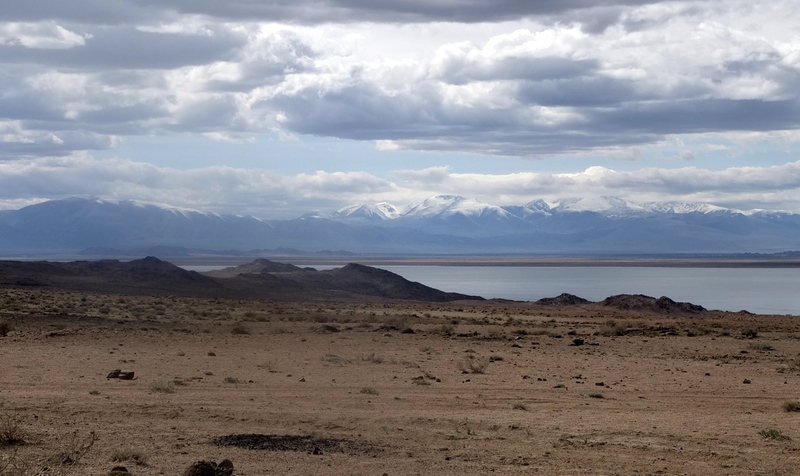 I soon crested a hill and was rewarded with the first view of Uureg Nuur. On the descent towards the lake, a jeep followed and stopped beside me. It was father and son that lived in a ger right on the lake. They wanted me to come by and have tea. I think it was one of the most scenic ger locations I’ve seen yet. I was given süütei tea, which I have grown to really love. I also tried some of the most delicious fresh yogurt. I went through my usual communication routine of flipping through my Lonely Planet phrasebook and in turn passing it over for my hosts to find questions to ask me. Later in that ger, I faced one of the biggest mental challenges of the trip so far. 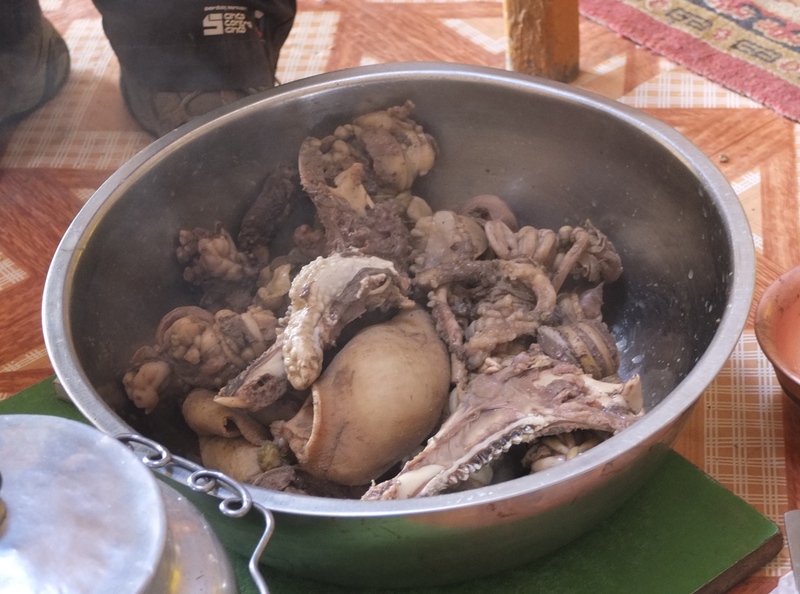 My kind host prepared a meal for me and boiled sheep innards was on the menu. I must say that I have a fairly wide palate and the very idea of what it was did not put me off. I just thought to myself that maybe it would taste better than it looked and smelled. It failed in both categories. I ate as much as I could stomach so as not to be rude to my hosts. They gave me a large bowl and continued to fling miscellaneous chunks into it. 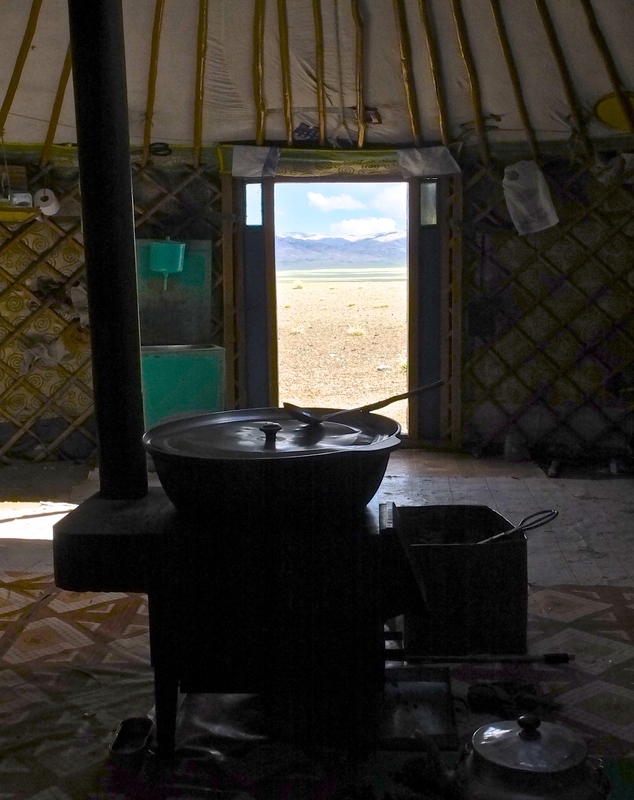 I read later in my Lonely Planet e-book that there are two types of cuisine in the Mongolian countryside. “Nomad’s food” is normally prepared by women and included the noodle type dishes I was used to. 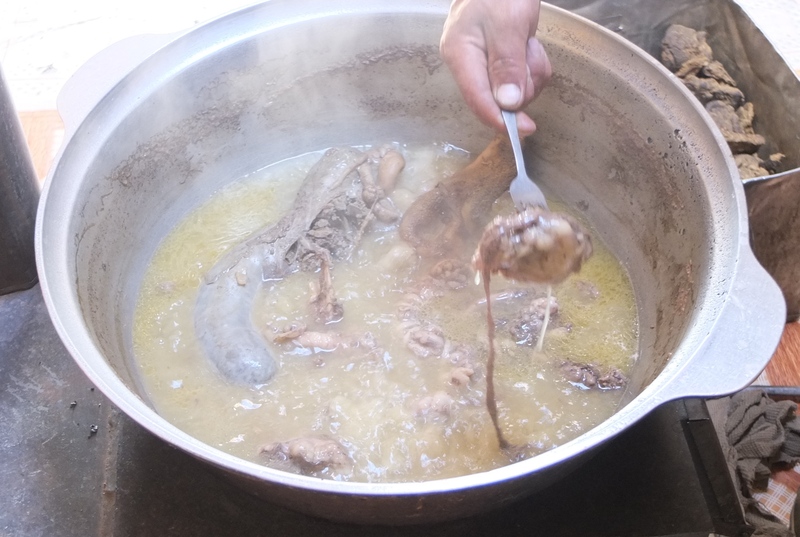 And then, there is “Hunter’s food” prepared exclusively by men – usually meat and intestines that are boiled or barbecued. So maybe next time if I see no women around, I will pass on the offer for lunch. 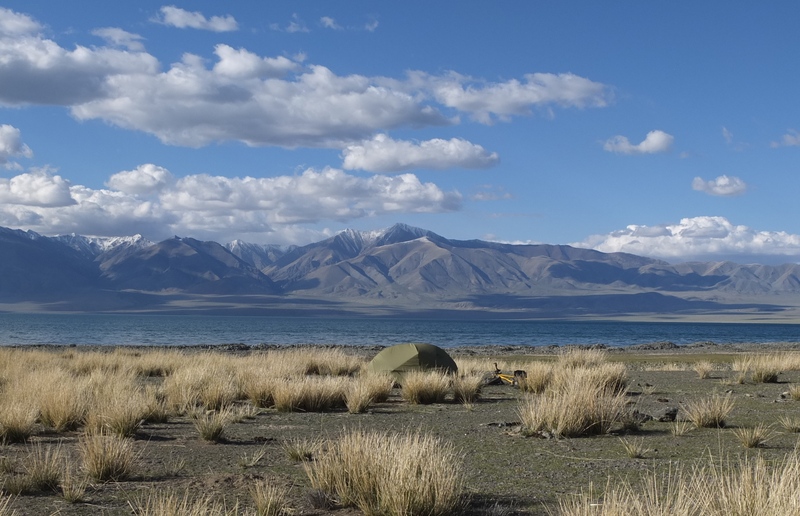 I camped near the ger that night, right by the lake. The father came to my tent in the middle of the night to make sure I was OK and felt safe. He took my hand a briefly cupped in his to make sure I wasn’t cold. I felt like he was my own father looking out for me. I regret not giving him a proper goodbye the next morning. 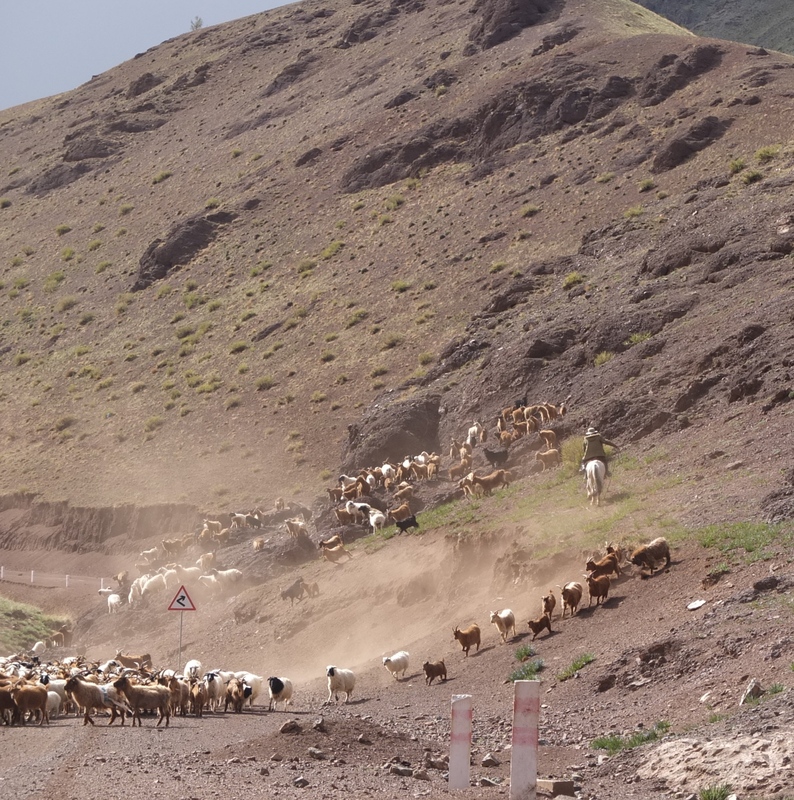 I knew I had a tough day ahead as I would have to cross the Bairam Davaa pass (2570m). I had read in several cycling journals that pushing was almost guaranteed due to the rocky and steep track. 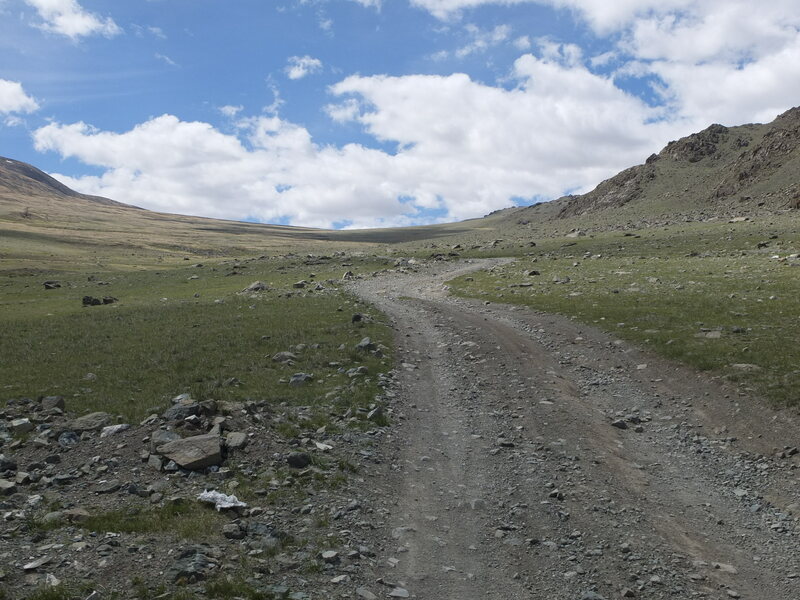 I started to climb away from lake and about with about 5km to the top of the pass, the pushing began and continued for a few hours. My bike is a 60kg transport truck so pushing up was agonizingly slow. I would only be able to go 50m or so before I felt dizzy and would have to take a break. 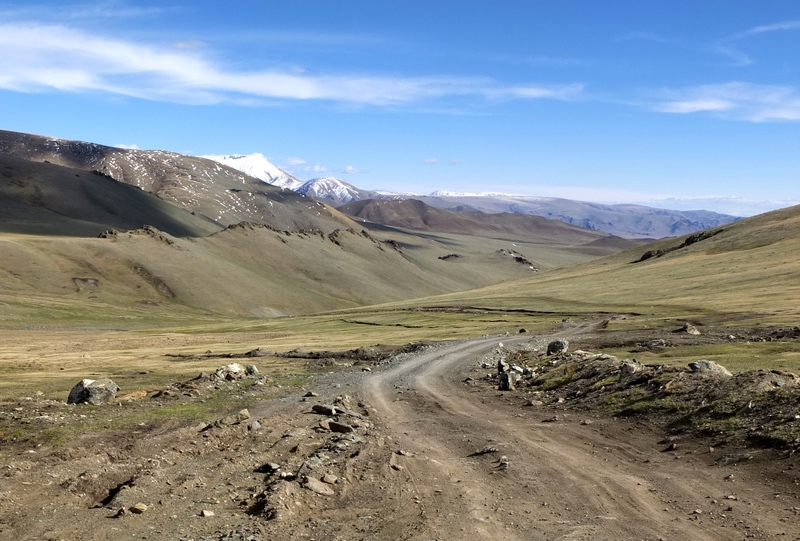 When the road finally became rideable, the view opened up to the surrounding peaks. 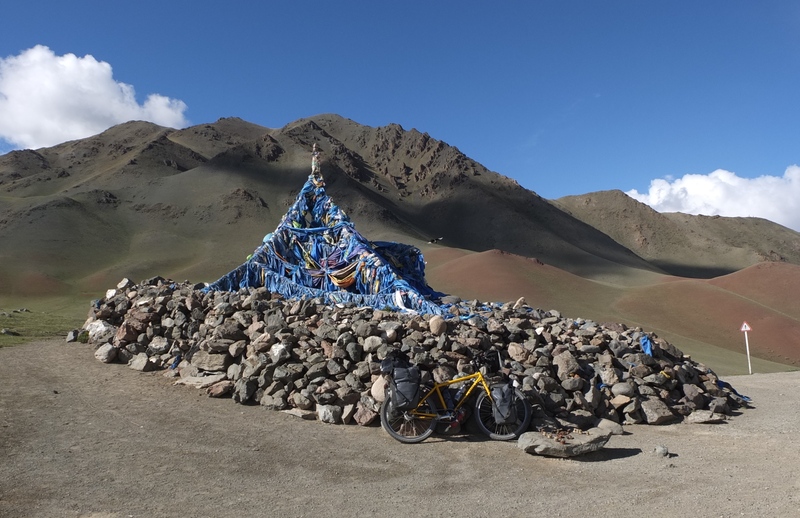 After another kilometre or so, I could see the ovoo!! I was beyond excited and yelled out loud for no one to hear. I reached the top. I was finished. After that a great (if rocky and slow) descent followed. 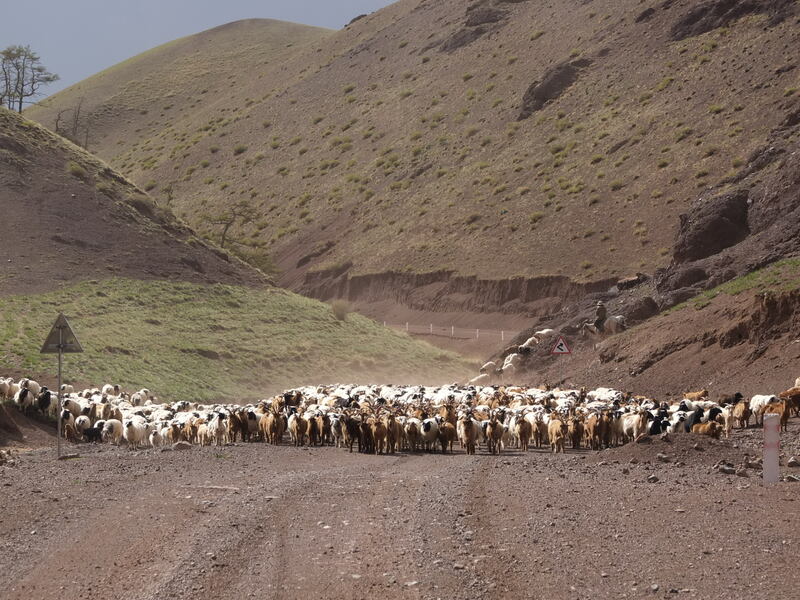 I dropped down into a beautiful valley and was soon spotted by a group of people near a ger. They waved for me to come over. After much ooohing and ahhing over my special letter “Ohhhhh, Tapa!” (Tara in cyrillic),this awesome and enthusiastic bunch let me take a photo of them. 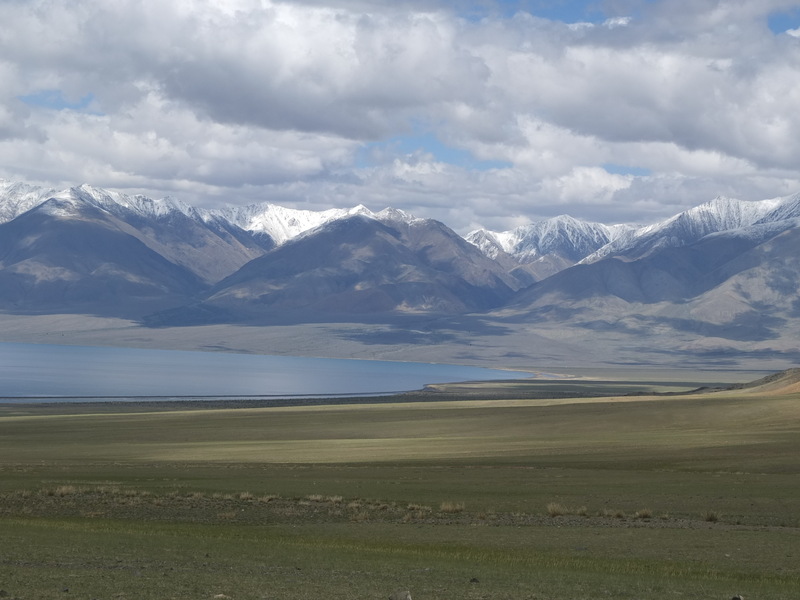 My “special letter” is a letter I have written giving details about me and my trip, which I have translated into Mongolian. 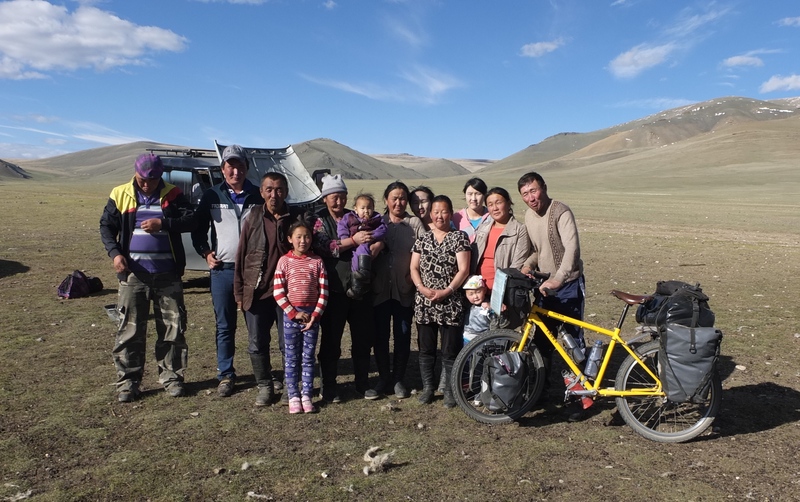 About three kilometres from the mining village of Khotgor, I camped for the night. 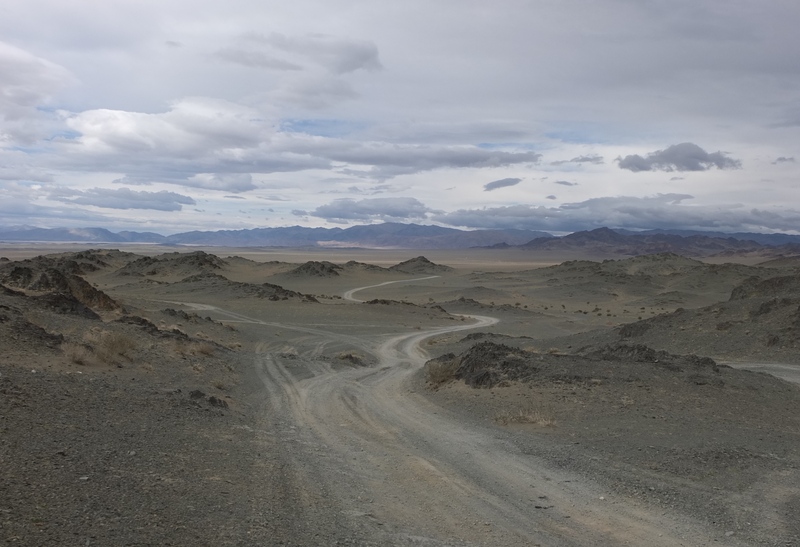 Khotgor was a pretty desolate and dreary place, right beside a coal mine. 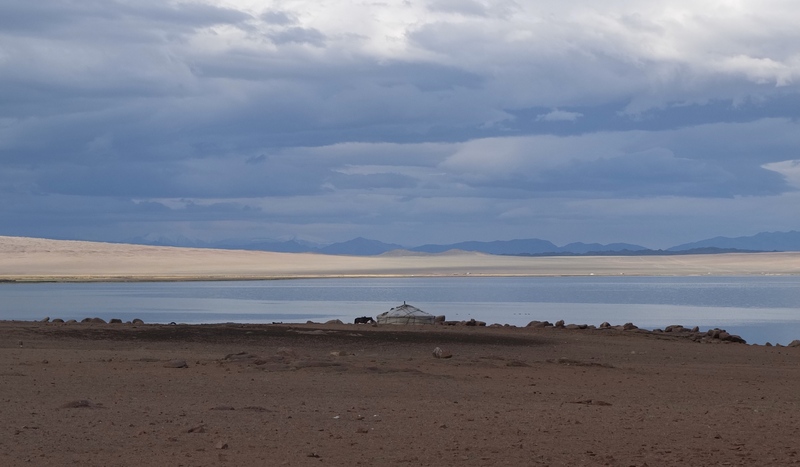 The next day I picked up what meagre supplies were available and moved on towards the next lake, Achit Nuur. And then, of course, back to sand, my old friend. 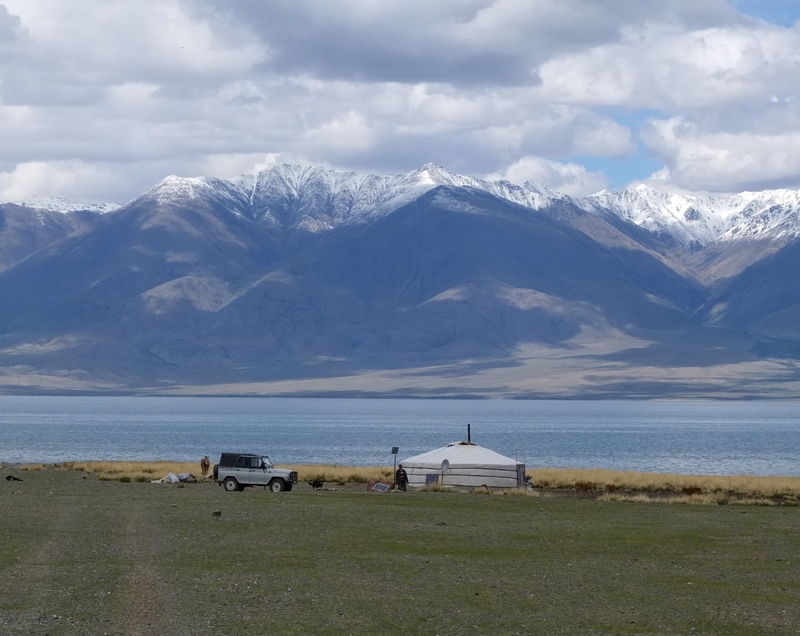 Overall it was a great day and I spent the night on the shores of Achit Nuur, where several Kazakh ger settlements dotted the shore line. 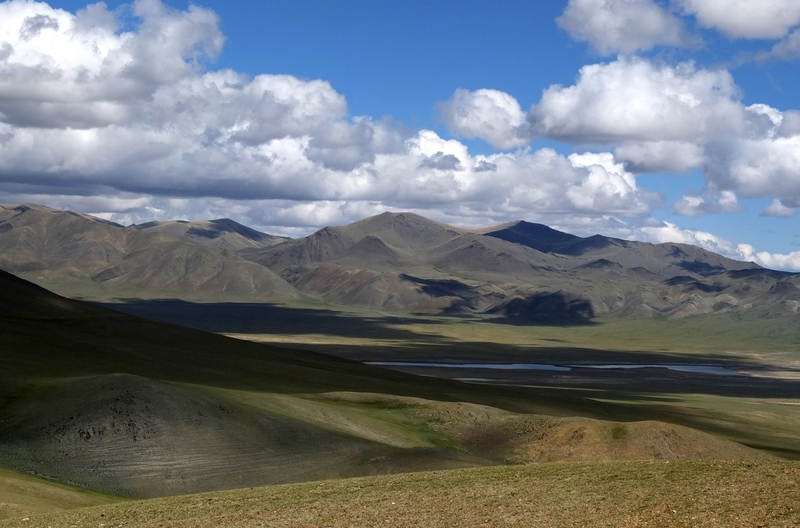 I gave myself an earlier start the next morning because I had wanted to reach Olgii, about 80km away. I knew there was another very rocky stretch of road ahead that would take a long time to cover. 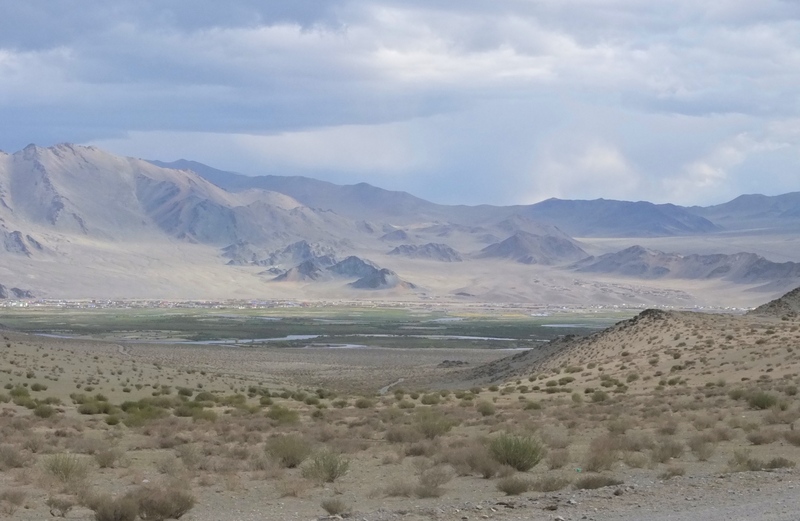 I continued my ride around Achit Nuur before climbing into the hills again. Later, I reached the track from hell. Rock, rock and more rock. 20km of it. I was offered rides by about five vehicles that day, who tried to tell me that the road was no good for a bicycle. I pedalled on at about 7km per hour, the severity of my saddle sores increasing by the minute. 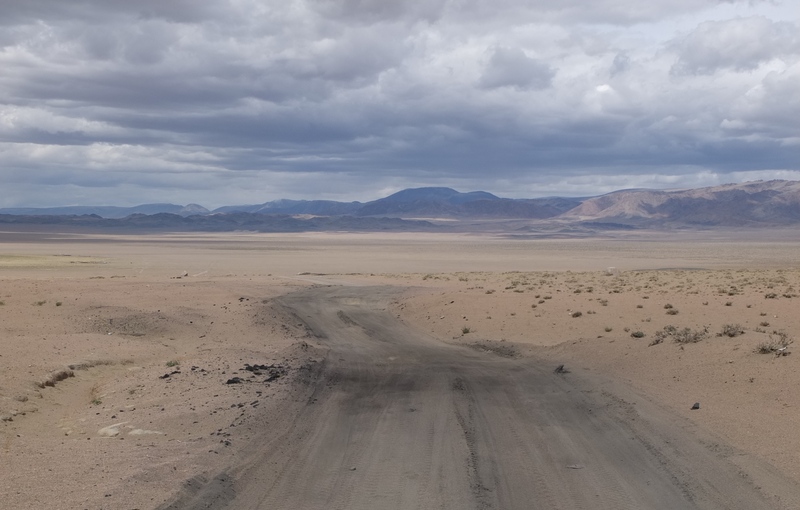 The road followed the Khovd Gol (river) for most of the way to Olgii. It offered pleasant roadside company to distract from the horrendous condition of the track. 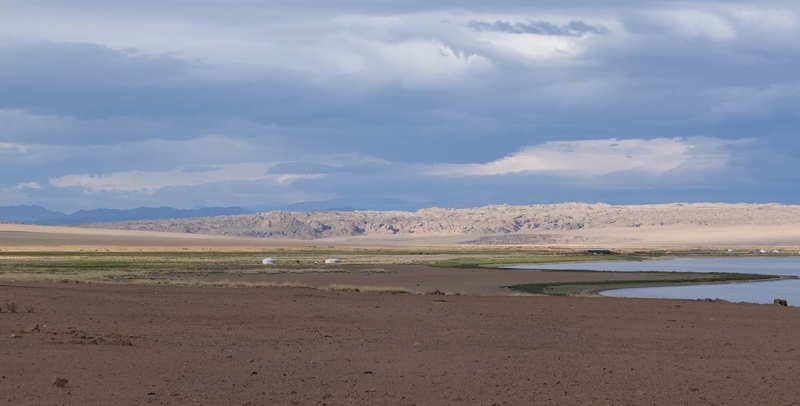 The pretty Khovd Gol. So nice to see green. 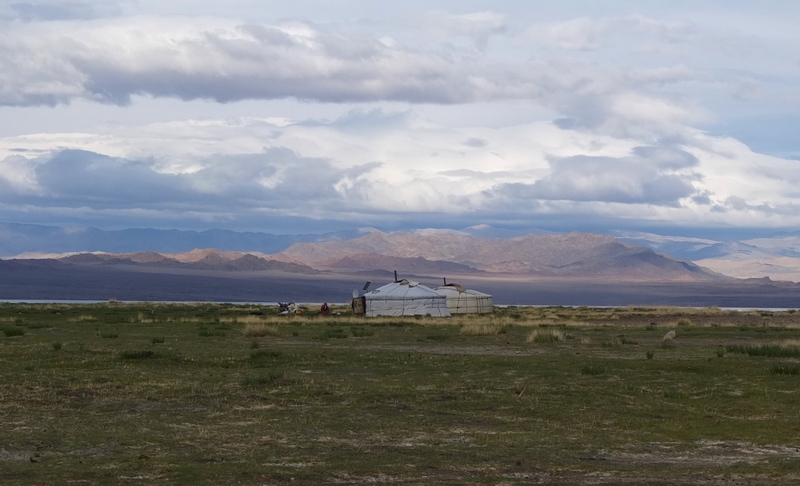 About 20km from Olgii, the wind turned on me and I felt very drained. I knew I had one more small pass before the city. I was thrilled when I reached the top and could finally see the buildings below. What a ride. But I was exhausted, finished. I have spent the last two days relaxing around Olgii at my cozy ger guesthouse, not really doing much, and I love it. 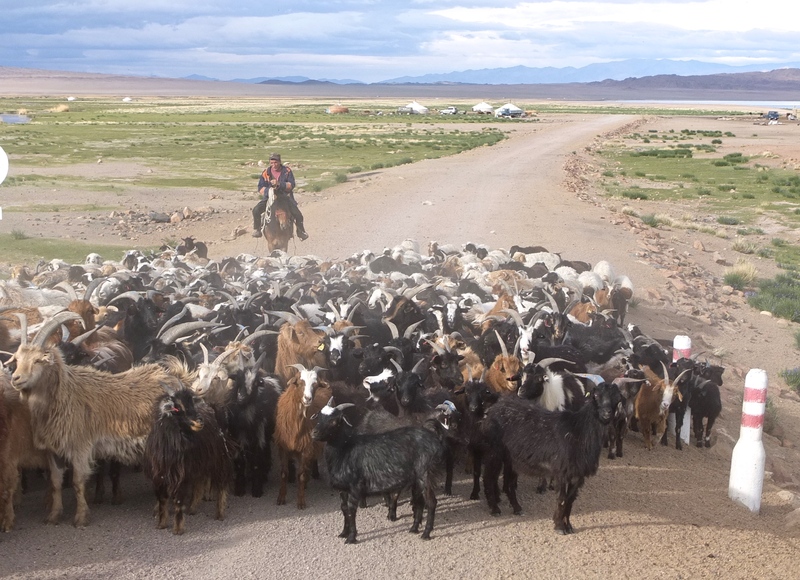 Olgii is very different culturally from the rest of the Mongolia that I have travelled in. 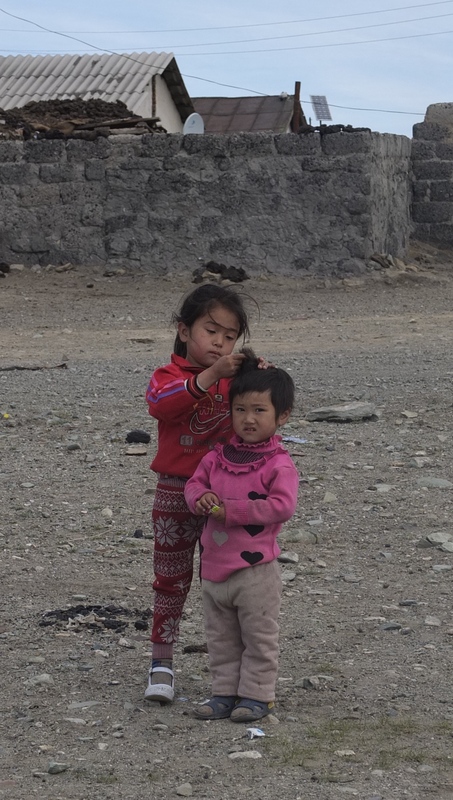 It is mainly Kazakh with a decent part of the population being Muslim instead of Buddhist or Shaman. There are several mosques around the city of about 28.000 people. 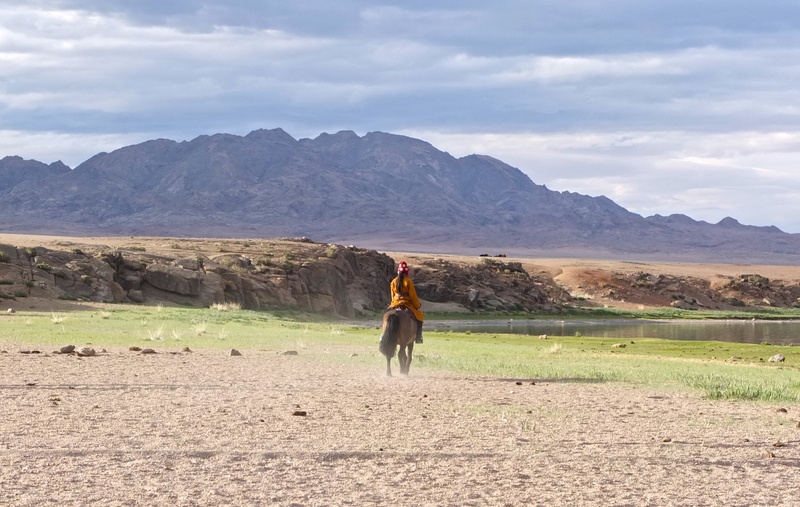 This region of Mongolia is also the home of Kazakh eagle hunters and there is a large festival in Olgii every year, taking place in October. Eagle hunting takes place in the winter. Marco Polo even documented the tradition in his travels. I am not sure if I will encounter any eagle hunters en route, as they are not active in the summer. 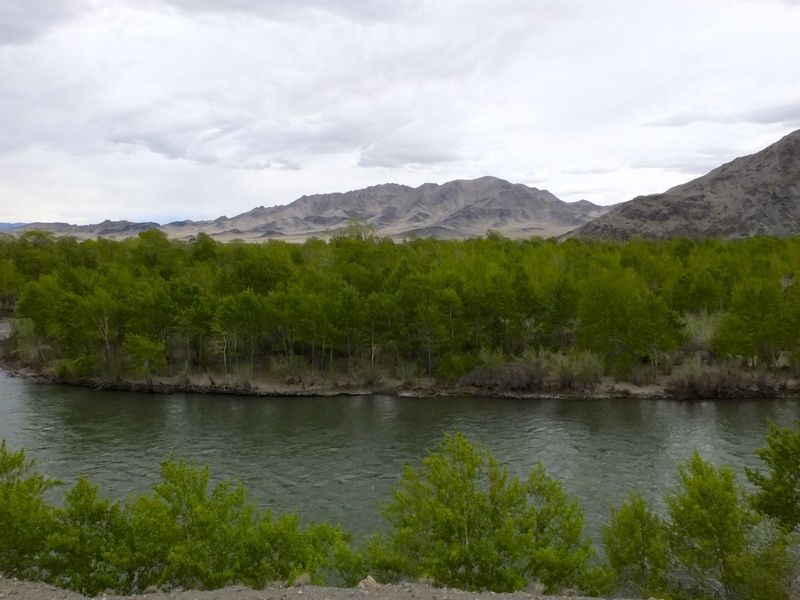 This region is also home to the Khoomei throat singers, a very old and sacred tradition. I had thought about making an excursion to see one, but on my rest days I tend to be a lazy tourist. 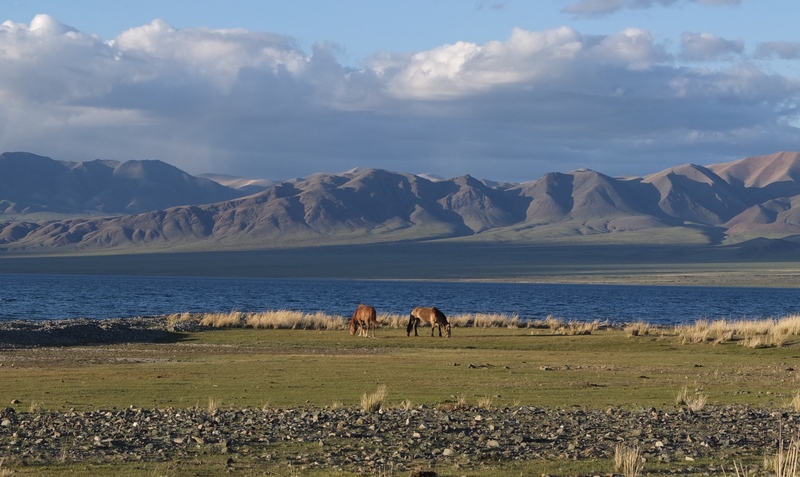 Tomorrow I am heading southwards towards Khovd and will continue south until the Chinese border at Bulgan, about 800km away. My wheels will be rolling through mountains most of the way. Amazing Tara!! Incredible scenery! Looking forward to your next blog. Safe travels my dear. Love to you! xo! Your journal continues to be a compelling read. At the same time, when I really do go “there” with your travels, I am in amazement at your bravery and grateful for the kind people you encounter. The scenery you have captured by camera is a wonderful enlightenment! Stay safe Margo Polo, and keep writing! Reading your inspiring blog from Barbados now…..still on my world travels like you, but without the pain and hardships….love your posts Tara, it is the most incredible thing you are doing! Thanks Steve! I would love to go back to Barbados too..very close friends I haven’t seen in years. The nomadic life is the best, isn’t it?